What was originally going to be a beach day took an unexpected turn at around 11:30am this morning, when Boyfriend decided he would instead take Matilda and I on a picnic. At first, I thought I was the most excited about the whole idea, but that was before I saw the look on Matilda’s face when we arrived at the park. No puppy pre-school, no sleepover at the kennels, no drive around the block and not even her favourite treat could compare to the excitement of seeing all of those ducks in that pond; she was over the moon. 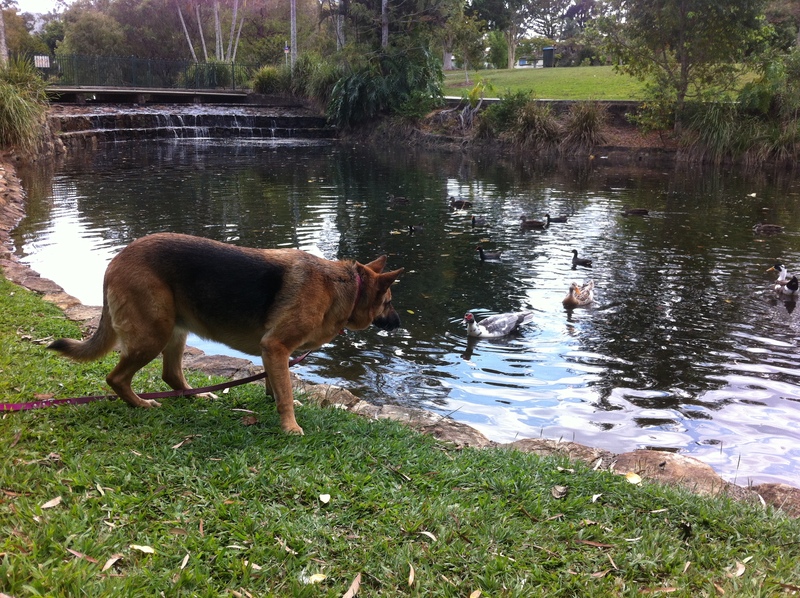 I’m not sure she really knew what she was looking at to begin with, because at home, our ducks don’t swim. We don’t have a pool and we don’t have a pond, so the only ducks she has ever seen have been land animals. Just your usual run of the mill feathered friends, that spend their days waddling along the ground. These ducks though, these ducks could swim. From the moment she saw the first little duck swimming along the water, she was ready. There was just one little problem, my big brave Matilda just happens to be afraid of the water and considering this duck was quite happy to spend his day floating about in his big giant pond, he wasn’t leaving Matilda with much chance of having duck for lunch. That didn’t seem to stop her from trying though. By the time we were ready to leave, I had lost count of the number of times she had paced back and forth along that pond, just waiting for one of them to cross over on to the land. Finally though, when a group of them actually did decide to leave the water, she was so shocked that they could walk as well as swim, that she had somehow forgotten how to move. So instead of trying to chase them, she continued to sit there staring at the ones still floating across the water. Brave of her, I know. I think by the end of it all, the ducks had eventually caught on to the idea. They soon realised that she wasn’t in fact a big bad wolf, but was just a cute little puppy who was afraid of the water. A cute little puppy who although she thought otherwise, was not actually going to have duck for lunch.